NTRUHS MBBS,BDS 2nd Phase Web Counselling, Web Options dates/Schedule 2018: Dr. NTRUHS has given the MBBS-BDS 2017- Convener Quota(A Category ) Detailed Notification for 2nd Phase of Web Options. 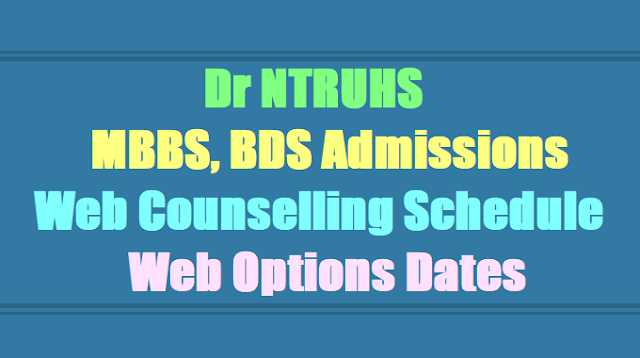 Second phase web options for filling up the vacant seats in the medical and dental colleges for admission into MBBS/BDS courses: The 2nd phase of exercising web options to fill up the vacant seats under Competent Authority Quota in MBBS/BDS courses in Government, Private Un-Aided Non-Minority, Minority Medical and Dental Colleges (under Dr. NTRUHS) and MBBS seats in Sri Padmavathi Medical College for Women (under SVIMS), Tirupati for the year 2017-18 in the State of Andhra Pradesh will be from 2.00 PM on 05.08.2017 upto 2.00 PM on 07.08.2017. The candidates whose names are present in the Final Merit List displayed on 22-7-2017 after verification of Original Certificates are only eligible to exercise web options from Home or any Net center. The candidates, who secured admission in 1st counselling and wish to change their college/course according to their merit, can exercise their web options. The candidates who are not joined in the colleges allotted in 1st counselling can also exercise web options in the 2nd counselling. Rs. 9,600/- for both MBBS and BDS Courses have to pay before obtaining allotment letter through payment Gateway by using Online payment method. (Debit Card/Credit Card/Internet Banking). The candidates who have made online Payment and downloaded allotment order in 1st Phase and now willing to slide from one Medical College to another Medical College and one Dental College to another Dental College and Dental to Medical College in the Andhra Pradesh need not pay University fee again. The selected candidates have to pay Tuition fee for admission into MBBS/BDS Courses as per Government of AP Orders at the respective College. Candidates while giving options should note that the seats vacated by the candidates selected in first counseling and slided to other college / course will be added & allotted simultaneously during this counseling. The allotted seat in first counseling will be cancelled automatically on sliding to other college as per their option. "The details of vacant seats available will be placed in the University Website on 05.08.2017". 2. The candidates who have not exercised web options in 1st Phase are also eligible to exercise web options. 3. Candidate can exercise options for MBBS/BDS courses in all the colleges in which they are interested to join as per the priority irrespective of Vacancies displayed. There is no limit to the number of options. 4. One Time Password will be sent to the registered mobile at the time of saving Web options. 7. Candidates have to download the allotment letter by paying the University fee by gateway method (as detailed in the earlier notification dated 22.07.2017. 8. Candidates have to take printout of allotment order, check their allotment and report to the Principal of respective college before the date specified on the allotment letter. 9. The University fee and other fees once paid shall not be refunded under any circumstances. 10. Help Desk Numbers: for information relating to exercising web options (Technical): 9490332169, 9030732880.